Create a Shape Map visual to compare regions on a map using color. Unlike the Map visual, Shape Map can't show precise geographical locations of data points on a map. Instead, its main purpose is to show relative comparisons of regions on a map by coloring them differently. Shape Map visuals are based on ESRI/TopoJSON maps, which have the compelling ability to use custom maps that you can create. Examples of custom maps are:geographical, seating arrangements, floor plans, and others. 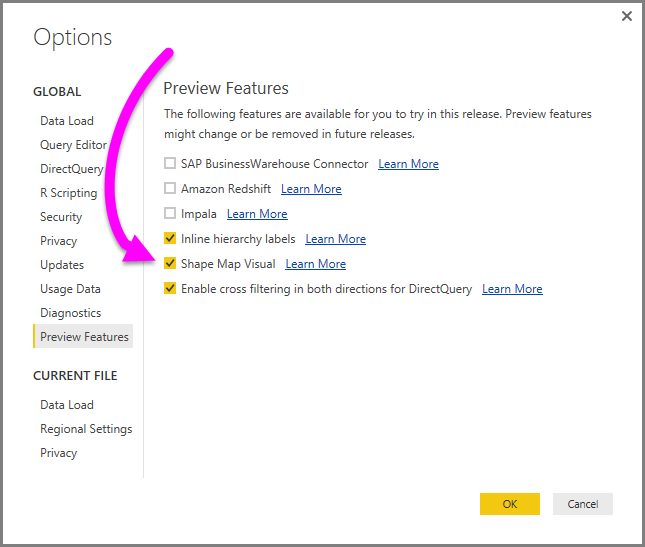 The ability to use custom maps is not available in this Preview release of Shape Map. You can test the Shape Map control with the maps that are shipping with this Preview release, or you can use your own custom map as long as it meets the requirements outlined in the following section called Use Custom Maps. 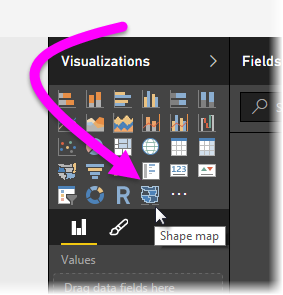 The Shape Map visual is in Preview, and must be enabled in Power BI Desktop. To enable Shape Map, select File > Options and Settings > Options > Preview Features, then select the Shape Map Visual checkbox. 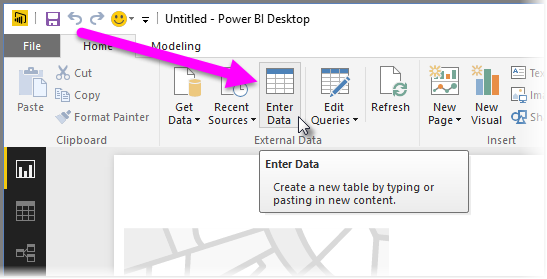 You'll need to restart Power BI Desktop after you make the selection. Once Shape Map is enabled, click the Shape Map control from the Visualizations pane. 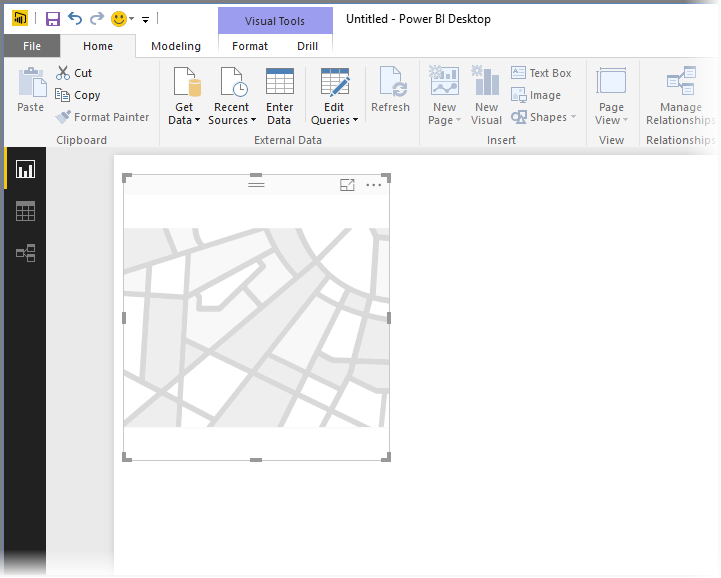 Power BI Desktop creates an empty Shape Map visual design canvas. In the Fields pane, drag a data field that has the region names (or abbreviations) onto the Location bucket, and a data measure field into the Color saturation bucket (you won't see a map yet). See the section titled Getting Map Data, below, for information on how to quickly get map data to test Shape Map. 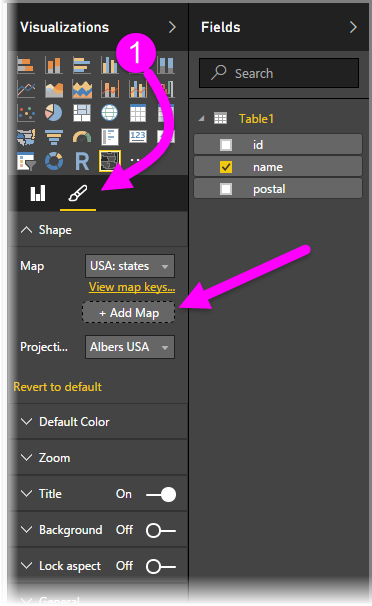 In the Format settings pane, expand Shape, and select from the Standard Maps drop-down to show your data. At this point, the rendering appears, as shown in the following image. In the Region Keys section at the end of this article is a collection of tables that have map regions keys you can use to test the Shape Map visual. You can then modify the map projection and zooming settings, as well as the colors of data points, from the Format settings pane. You can also modify zoom settings. For example, you can change colors, set maximums and minimums, and so on. You can also add a category data column to the Legend bucket, and classify the map regions based on categories. You can use custom maps with Shape Map as long as they are in the TopoJSON format. If your map is in another format, you can use online tools such as Map Shaper to convert your shapefiles or your GeoJSON maps into the TopoJSON format. 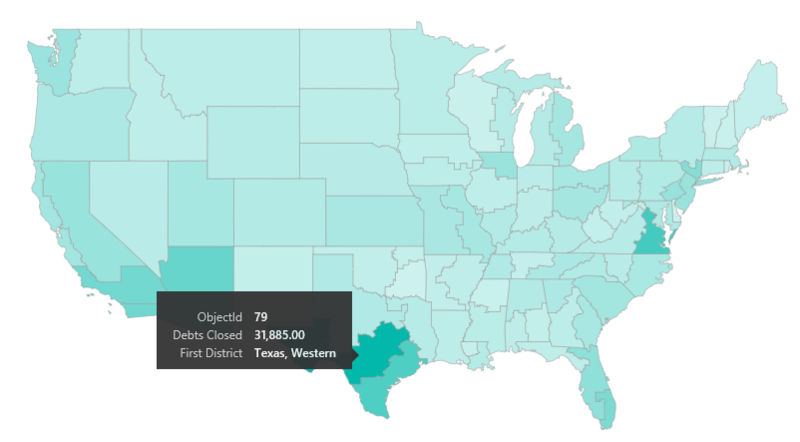 To use your TopoJSON map file, add a ShapeMap visual to your report and add some data to the Location and Color saturation buckets. Then, in the Visualizations pane with the Format section selected (shown as (1) in the following image), expand the Shape section and select + Add Map. Since states can be divided into multiple districts, we have to use a custom shape map. 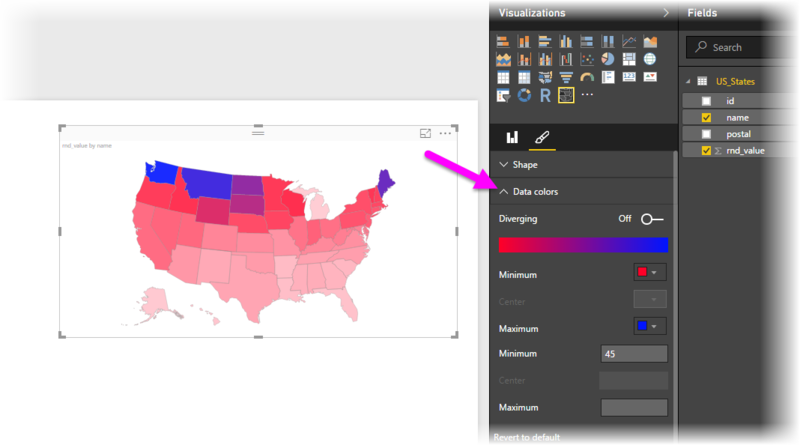 By importing the TopoJSON map of the U.S. judicial districts into Power BI Desktop, we can then visualize the annual fiscal district attorney data. The image below shows an example of this map. You can do interesting things with the individual state maps as well, and show more detail based on the districts it contains. If you’d like to experiment with this dataset and visualization, you can download the original PBIX file that was used to generate this report using the following link. To quickly get data into a model so you can test Shape Map, you can copy one of the tables at the end of this article, then select Enter Data from the Home ribbon. If your data has multiple columns, you will need to use an editor like Excel to paste the data, then copy each data column separately. 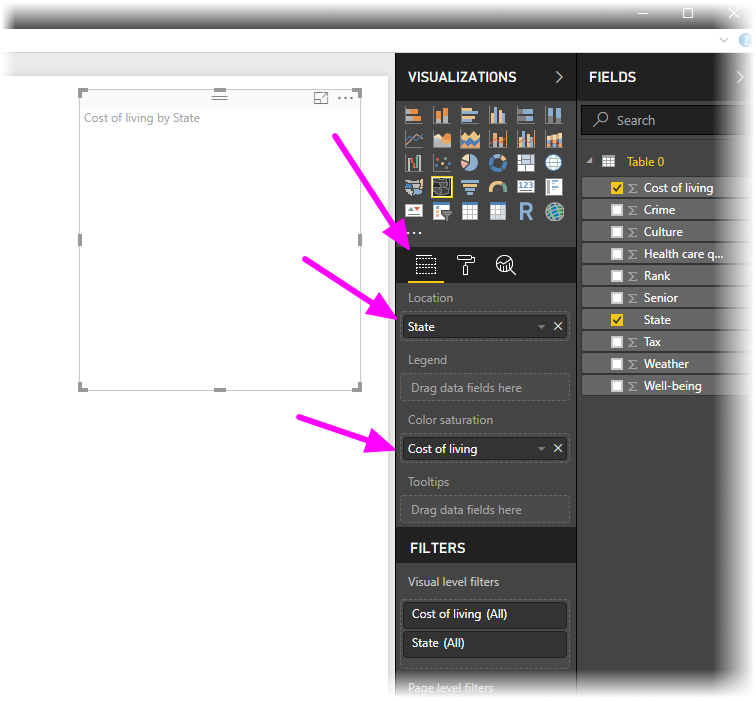 You can then paste the data into Power BI Desktop. The top row is automatically identified as a header. You can enter a new column simply by typing a new column name (in the blank column to the right), then add values in each cell, just like you can do in Excel. 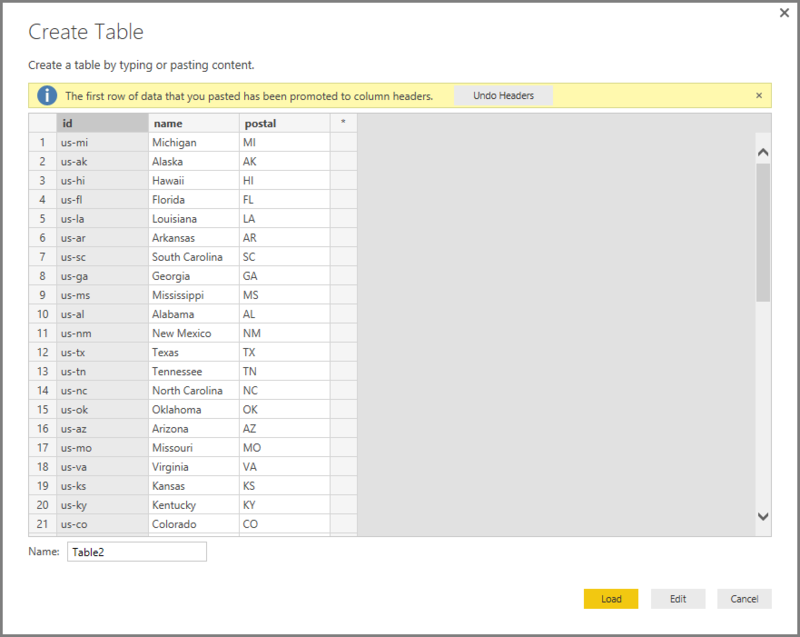 When finished, select Load and the table is added to the data model for Power BI Desktop. When working with countries or regions, use the three-letter abbreviation to ensure that geocoding works properly in map visualizations. Do not use two-letter abbreviations, as some countries or regions may not be properly recognized. If you only have two-letter abbreviations, check out this external blog post for steps on how to associate your two-letter country/region abbreviations with three-letter country/region abbreviations. 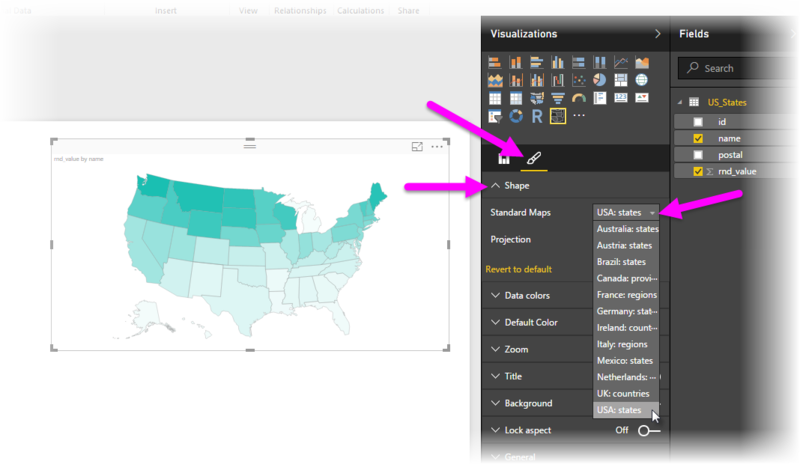 The Shape Map visual is in Preview, and must be enabled in Power BI Desktop. To enable Shape Map, select File > Options and Settings > Options > Preview Features, then select the Shape Map Visual checkbox. Currently, you must also have the Color saturation bucket set in order for the Legend classification to work properly. The final release version of Shape Map will have a user interface that shows the map keys of the currently selected map (there is no date set for final release, and Shape Map is still in Preview). In this Preview release, you can reference the map region keys in the tables found in the following Region Keys section of this article. The Shape Map visual will plot up to a maximum of 1,000 data points. Use the following Region Keys in this Preview release to test Shape Map.